Join us with your favorite cocktail every Friday & Saturday night for live music upstairs in the intimate setting of the Bernard Ballroom. Shows are free of charge and are primarily focused on jazz, blues, or funk. On April 7th 1933, the town of Arvada issued their first Tavern license to Adrian Kline of the Arvada Tavern, allowing for the first time in history the legal sale of alcohol to the public in the town limits of Arvada. For the people of Arvada this was a day of liberation. 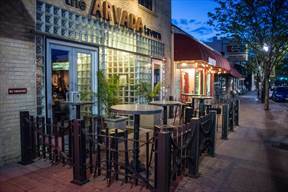 The Arvada Tavern focuses on keeping that same liberating feeling alive with our great service while maintaining our vintage yet vibrant atmosphere. We feature 10 select Colorado fresh brewed draught beers while offering a list of properly built traditional cocktails that pair well to our chef produced local classic dishes.